If you are in Armenia in hot summer and you do not know how to get cooler or you just want to taste fantastic fish barbeque in all the seasons of the year, go to Gegharkunik Province. 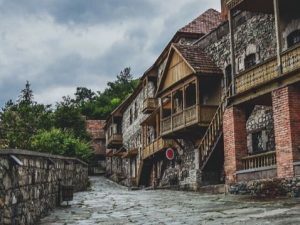 This is the largest region in Armenia where people speak in a very interesting dialect, cook thousands of dishes with potatoes and fish, bake the most delicious baklava in the world (pastry with layered dough, nuts, and honey) and, most importantly, enjoy the coolness and luxurious beauty of the lake. Yes, yes, today we will present Armenia’s blue-eyed beauty, Lake Sevan; to see it, we should go to north-east from Yerevan. 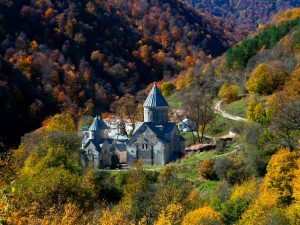 The distance from Yerevan is about 60km, that is to say, 40 minutes to drive, and a magnificent view will open in front of you. But before starting to enjoy the scene and the local cuisine, you should know this: Gegharkunik is also one of the coldest regions in Armenia where the sun, however, has an interesting feature – while warming it “burns” at the same time and almost in all seasons. This means, both in summer and winter it is necessary to take warm clothes and special creams for skin care. If you already have the appropriate accessories, let’s go. By the way, you can reach Sevan also by train, but it only operates in summer. Now we will talk a little bit about the lake, for you appreciate why it is considered a true “jewel” not only of Armenia but also the region. The surface area of the lake is more than 1,240 square kilometers, the average depth is 30 meters, located at an altitude of 1,916 meters above sea level. An endemic resident of the lake is Sevan Trout (ishkhan) with its four species: “gegharkuni”, “summer bakhtak”, “winter bakhtak”, and “bojak”. Sevan is the largest lake in the Republic of Armenia and the third largest in Armenian Highland after Lakes Van and Urmia. It is unique in the South Caucasus. It is the biggest freshwater reservoir in the region, with 28 rivers flowing into the lake. According to geologists, Lake Sevan has a volcanic origin. During a volcano eruption in the Geghama mountain range, the lava closed the flow of Hrazdan River forming a basin. Later on, as a result of the accumulation of melted ice and river water, the basin was filled with water, creating the lake. Archeologists testify that the coastal zone of Lake Sevan has been inhabited since ancient times. Bronze Age “Cyclopean” castles (Lchashen, Hayravank) were found in the basin, preserved structures and inscriptions of Urartian era, medieval structures (Sevanavank, Hayravank), settlements, and “khachkars”. If you have enjoyed the beauty of the lake, taken photos, swum and tasted different fish dishes served in one of the numerous eateries along the coast and in the end drunk Armenian herbal tea, then you should move to Sevanavank on Sevan peninsula. You may reach there on foot, so do not worry about the car. The monastery was built in the 4th century, founded by Gregory the Illuminator. Centuries later, two more churches were built in that area: Araqelots and Astvatsatsin. 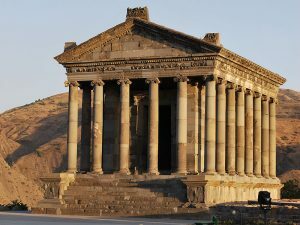 By the way, the carved wooden capitals of “gavit” columns are now kept in the History Museum of Armenia and in Hermitage. 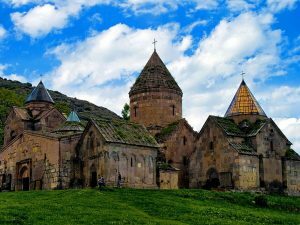 By Green Travel Armenia in Blog on December 4, 2017 at 7:52 am.